As we head in to October, it is always nice to take a look at what we have accomplished and what we are thankful for. Take a few minutes yourselves to think about this. If you celebrate Thanksgiving with family and friends, this is a great conversation to have! All our fantastic caregivers who are always there for our clients, even when it’s a last minute “please, we need you!” request. Our Client Services team who somehow manage to make the schedule work and look easy to the families, when we know that sometimes this can take hours to fill just one shift. 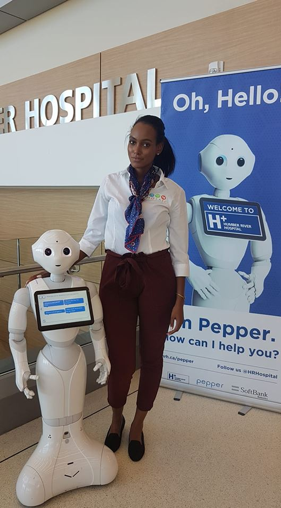 A Warm Welcome to our newest employee! Beth Eshete is our new Community Resource & Social Engagement Coordinator. You will see a brief explanation of her role and a bit of information about her later. Beth will be focusing on organizing more programs and also working alongside the team on the Community Mapping Project. Everyone at Mosaic has an important role and we are thankful for everyone! 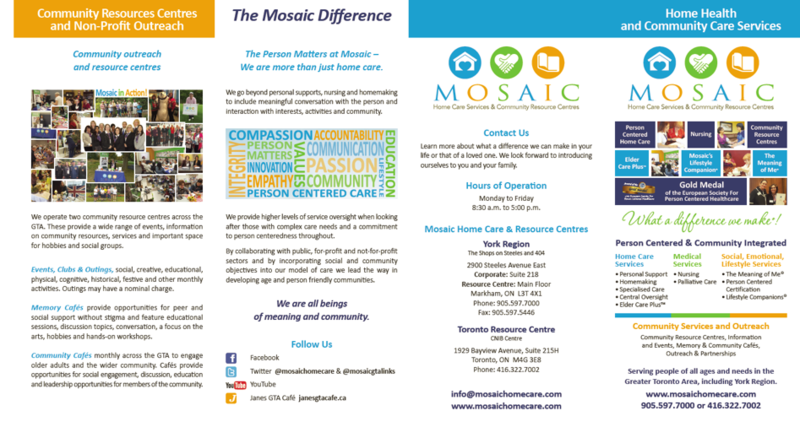 The past few months we have been busy with the new format of our fall newsletter and our new fresh look with our newly designed Mosaic brochure coming out shortly. Here is a teaser of our new brochure. We hope you like it the new changes and looking forward to hearing your responses. It is a time to Give Thanks. Thanks for all of the small things in your life that happen daily as well as the big things. Thanks for the sunshine and warm breeze on a fall day. Thanks for the transit system that gets us around safely every day. Thanks for the 3pm cup of coffee that keeps us going! Thanks for a charged cell phone that lets you connect to people 24/7. 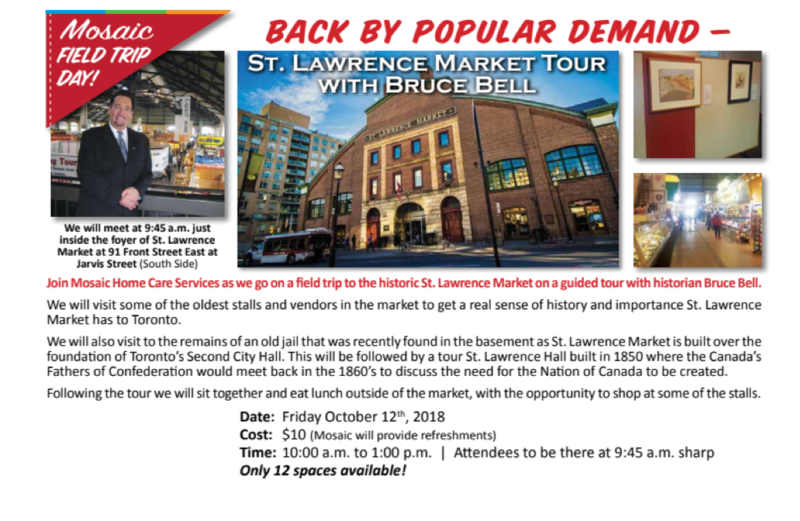 And, thanks for the (traditional) end of work day at 5pm……..
As for future speaking events we expect to be in London UK in December and have an invitation to present at this November’s Ontario Society of Senior Citizens Organizations (OSSCO) conference. Last week we held our first advanced training session for our person centered community integrated model of care that addresses the important social and emotional needs of the person. This is our “The Meaning of Me® program”. Jane Teasdale and Martha Miller (Client Liaison) took the first group of caregivers through the session that involved role playing and other activities and presented at the end a certificate recognizing their successful formal induction into our model. 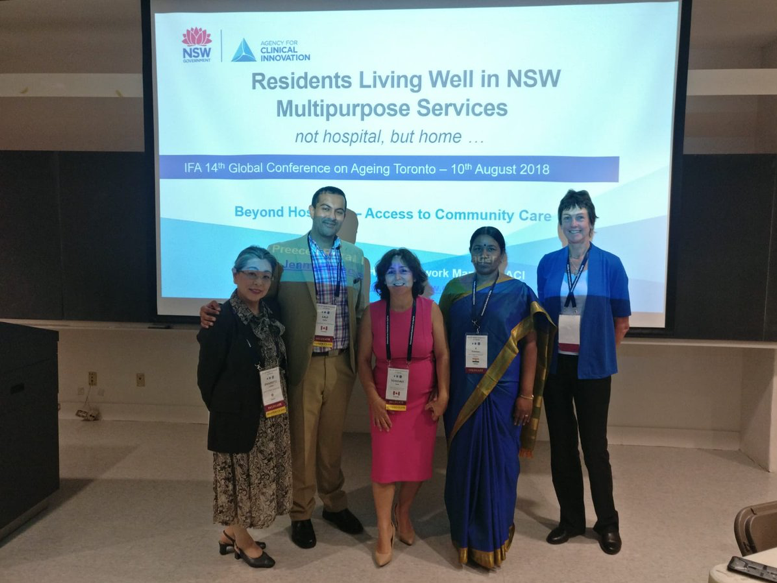 Our model is also introduced to caregivers at orientation as well as through Client Liaison visits with clients and families, so this is an advanced extension to our person centered care processes. Please the photos of the session and the newly certificated front-line staff. Mosaic’s Bereavement and Palliative Care Support for our Front Line Team! This is a new support service intended to provide grief counselling and guidance for frontline caregivers, nurses and companions who have been personally affected by the death of persons in their care. Working with people as closely as we do in the home care field, it’s inevitable that we will come across end of life situations. We recognize that an individual’s care team share a special bond with those you provide services to and their illness and passing can have a profound effect on you. They are more to you than “clients”, they can be friends and even surrogate family, and their loss can leave a mark on those left behind. The Bereavement Support Group brings together many years of collective experience and unique perspectives on the palliative care and grief journey. The service will provide tips on working with Palliative Care and End-of-Life clients (both clinically and emotionally), how to respond to the death of a client, what is expected (if this is new to you), mixed emotions regarding death and loss (complex grief) and the loss of a family member, friend, partner or anyone close. “We are Here for You” – How do you reach us? Evergreen’s professional counsellors offer support and guidance to clients living with their own life-threatening illness and prognosis, a diagnosis of such an illness in a loved one, the impending death of a loved one or the grief process. 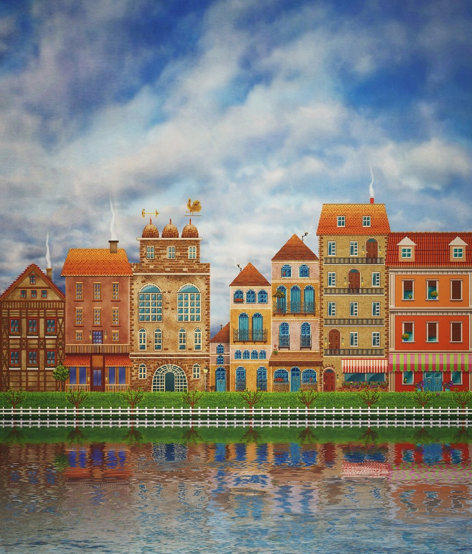 Our focus is on quality of life. Specially trained volunteers are also available to listen and provide support. Introducing Beth Eshete our Community Resource & Social Engagement Coordinator. My name is Beth Eshete, I am honoured to be the newest member of the Mosaic Home Care Team! My official title is the Community Resource and Social Engagement Coordinator. What this essentially means is that I will be overlooking the Mosaic Home Care Community Resource Centres, developing new and diverse programs and figuring out ways to make resources more accessible to individuals, families and caregivers. One of the reasons I was drawn to apply for this position was that it would provide me with a platform to engage with people on an organic level to assist in identifying needs and work in partnership with community members to create appropriate solutions. From personal experience and engaging with active members that come to programs at Mosaic, it is clear that there is a direct correlation between healthy living and the utilization of support systems at any stage in life. I believe that we owe it to ourselves to engage in our community spaces and programs to continue living healthy, vibrant and rewarding lives. 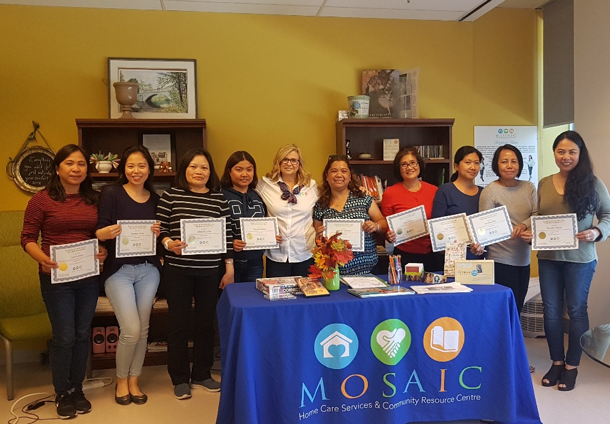 Mosaic’s Person-Centered Care model focuses on the individual in caregiving but through the development of two Community Resource Centres, Mosaic has illustrated their commitment to serve and cultivate the communities that they belong to; this is something that I am thrilled to be a part of. Over the next few months, I will be working on developing new programs for members to take part in for the New Year. We have been looking at implementing dance classes, volunteering opportunities and more educational workshops but I would also love to hear from you! 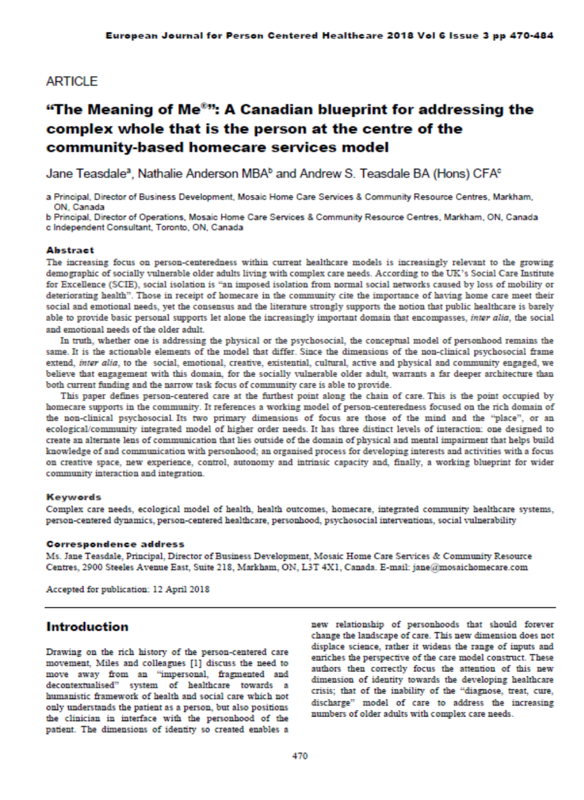 If you want to contribute ideas of what programs you would be interested in please do not hesitate to contact me through email at beth@mosaichomecare.com or through telephone at 905-597-7000 ext. 242. You can also stop by the Community Resource Centre and see the new window design for fall – The Comforts of Home is the theme of the month. With a focus on all things that comfort us in fall. A nice warm wool blanket, hot chocolate, walks in the forest to see the leaves changing, heart-warming soups and food. While you view the fall window at Mosaic at The Shops on Steeles please come in an introduce yourself. At Mosaic we believe that the people are persons of being, meaning and community and that engagement with our communities and our neighbourhoods are important to our health and well-being. We are presently undertaking what is effectively a long-term community mapping project. We have already had an initial project meeting with a number of community organisations and will be keeping you posted on ongoing developments. Our current newsletter provides a bit more information on this project and we expect to provide a more detailed blog on the mapping project in the not too distant future. This is a long-term project, and we are excited to have some concrete information already! Our pole walking and knitting groups were very successful. So much so that 2 (that’s TWO!) 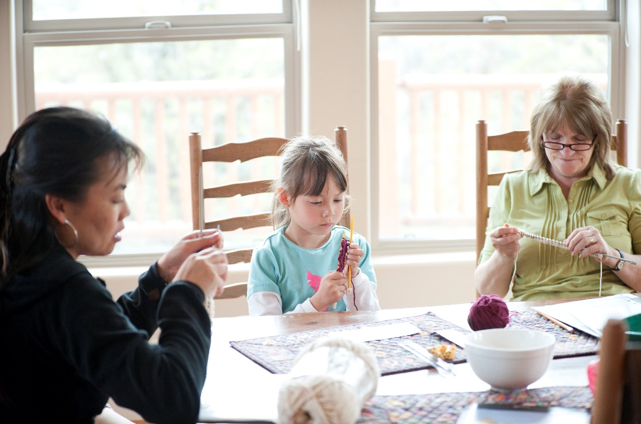 new knitting groups have been added to our programs. Most recently, Jane, Beth or Dina have participated in the North York Seniors Centre Fair, Better Living Fall Fair, Thornhill Village Fall Festival, Thornhill Seniors Centre Line Dancing Ontario wide event and Rally in the Ravine for North York General Hospital. It’s that time of year when Fall Fairs are popular and a few are included below and in the October Activity Booklet, found on the website. Click here to read more! Mosaic’s Community Café Come Help Define Our Community! Next Community Café at Markham is on October 22nd, 2018 1:30 p.m. to 3:00 p.m.
No charge for event. Refreshments provided. Close to public transit. Parking on main level with elevator access. Join us for an opportunity to chat, knit and make new friends. The benefits of knitting include: reducing stress and anxiety, slows cognitive decline and can help prevent arthritis and tendonitis. Morning group available to join – 9:30 a.m. to 11:00 a.m. Enjoy Walks This Fall with Mosaic! Would you like to join a free walking and Nordic Pole Walking Club? Stay in shape this Fall! Mosaic’s Pole Walking Club continues into the Fall and Winter with our Indoor Walking Club. We will be meeting once a month from September to November continuing again in January 2019. Staff will lead the walk from 9:30 a.m. to 11:00 a.m. with refreshments served after the walk. This is a great opportunity to get exercise and meet with neighbours from our community! (last class Thursday October 25th, 2018). Starting again in Spring 2019. No charge for event. Refreshments provided. Is run as a partnership between Alzheimer Society York Region and Mosaic Home Care, facilitated by Jonathan from Alzheimer’s Society York Region. Our Memory Café session provides a warm and friendly environment where you can socialize, build friendships and pick up information from local health and community organizations that provide support. This program is ideal for those who have been diagnosed with early Alzheimer disease and/or related dementias, those who worry about memory problems, and their care partners. When: Last Wednesday of every month: October 31st and November 28th, 2018. (Program will resume again on Wednesday January 30th, 2019). Baycrest – Hearing and Aging: What Can you Do About It? Why it is that as we age it seems that everyone mumbles! Time:1:30 p.m. to 2:30 p.m. If the program is booked up, we will offer this trip in the Spring again. 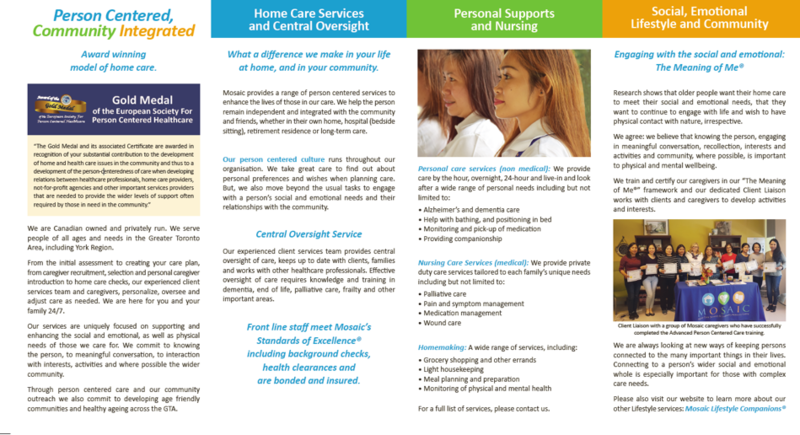 For a full list of programs and events, check the website often at www.mosaichomecare.com and read our fall newsletter. For events that are happening in communities in Toronto in the month of October please check out the Activity Booklet on our website.